How did we get our Teachers to Start Talking Nerdy? The best thing happened directly after this PD. I was in a breakout session room cleaning up and a teacher who is more cautious with exploring new technologies came up to me and said, “I’m going to go home and play now!” Best. Thing. Ever. Continuing that, I received about ten emails from non 1:1 staff that evening sharing ideas and excitement. When I walked into school the next morning, there was a huddle of five teachers discussing the PD and their ideas from it near the office. Exploration and collaboration were occurring! There was energy! I then collaborated with a teacher on how she could do this with her students and we brought Speed Geeking into the classroom to explore note taking strategies when researching. The League of EdTechies voted on some of the core apps that they felt would be important to all staff moving forward with our 1:1. We selected apps that had a range of complexity so that everyone would have an option to learn something at their level. We selected 6 apps and paired 2 League members per app. They created samples of how each app could be used in the classroom. Naturally, they created artifacts geared towards instruction and assessment- they did a phenomenal job! We emailed all staff members about a week before the staff meeting and reminded them to download Notability if they had not done so previously. This was a HUGE key to the flow of our PD because we could jump right into application and did not have to go through the hoops of downloading during the PD. We also had them bring a learning target that they would be focusing on next semester so that we could keep a strong focus on context and application during our PD. We started by getting everyone into our Schoology staff course where we house all of our staff meeting notes and taught them how to download a PDF and import it into Notability. This ties in with our idea of embedded PD- we didn’t give them much direction on how to use it other than about a 2 minute tutorial of the basics they needed to know to work with the document for this experience. We then went right into Speed Geeking by giving a short, one minute intro into what they needed to do as participants. The League Members were split up in somewhat of buffet style tables, we had 2 tables per app and split The League presenters up so that we could keep our groups small. We gave them 2 minutes to present their app to each small group. To keep the energy high, we played music when the two minutes were up. Of course we had to include classic mood-setters in our playlist like some of Marvin Gaye’s greatest hits! We had the presenters rotate and kept the rest of the teachers seated for ease of transition. When the rotations were complete, we regrouped and began our discussion of TPACK and repurposing technologies for educational purposes. Teachers had to then apply their knowledge to the learning target that they brought with them. The goal of the breakout session was to create an artifact that the teachers could use in the next semester (keep in mind, the majority of teachers only had 1 iPad in their classroom this year). We limited the amount of tutorial we gave teachers in the breakout sessions, pointed them to resources to help support their technical understanding, and encouraged them to explore and play with the technology. Very similar to the feel of a PLAYDATE. 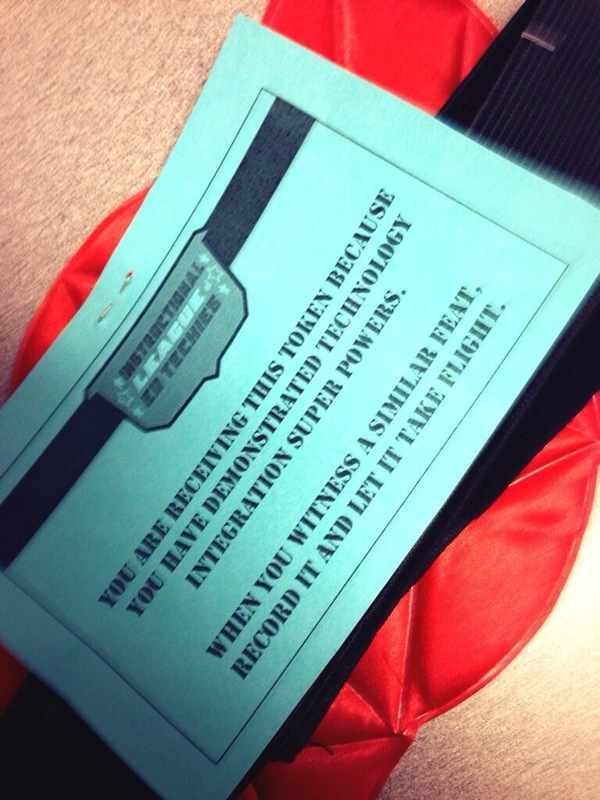 At the end of the PD, teachers completed an exit slip in Schoology and were awarded a digital badge signifying their reflection and participation in exploration of one of the certain apps. Categories: PD, Presentations | Tags: Adult Learning, edtech, embed, League of EdTechies, pd, presentations, redesign, Staff Development, TPACK | Permalink. Ok, here’s the truth: I’ve been incubating and drafting this post for about a month now. That’s because this is a big topic, like really big! Thinking about culture change in any environment encompasses a lot of grounding information, growing information, energy, questioning, and above all it is challenging to communicate all of the intricacies that come into play. Is there a succinct way to share this shift in culture without leaving something out? Here is my attempt at it! How do we engage adult learners in our educational setting? This is a question that I’ve been focused on for the past two years as I moved into a Technology Facilitator role. As educators, we create dynamic educational experiences for our learners. For some reason, when we create educational experiences for our educators (professional development), we do things that we would never do in our own classrooms- WHY?! We would never use our full class period to stand in front of a PowerPoint for 2+ hours (or the dreaded full day “sit and gets”) and then send students home without any sort of formative assessment, hands-on learning activity, connection builders, etc. So why is this acceptable for our adult learners and more importantly, how do we create a change? I have always believed that learning should be FUN! If you want to create lifelong learners, they need to experience the fun of learning at some point in their lives. I’d argue that most of the educators who are slow to adopt technology in the classroom have probably never had fun with it in an educational setting. Traditionally, we instruct educators how to “integrate technology” in a manner that is intimidating and is far from fun! You’ve probably been in a PD situation where you were trying to follow someone training a large group on a new technology and a few mouse clicks were heard, cursors were flying, and somehow an hour passed when you heard the presenter say, “…and that’s it, any questions?” That was stressful. Did everyone notice how lost you were? Why (or how) would you ever do that again? What did that have to do with your classroom? It was totally removed from the purpose. It was about the technology, not about practice. With taking the first step into 1:1 in our building this year, I knew that we had to have more people who were having fun with technology and we had to make it about their practice. True, fun isn’t the only way to create a change in culture, but through play we can create a culture of learners who are explorers, risk-takers, creative, connection-makers, adaptable, flexible, innovative, and more! If we were going to thrive and not just survive, we would need more educators with the qualities previously mentioned. I needed to take action towards creating a culture change- I was going to bring play and fun to adult learning in our building. Edcamp, PLAYDATE, TeachMeets, and Twitter chats are all such fun PD experiences to be a part of. The reason each is fun differs- some are inspirationally fun, others are hands-on fun, some inspire play, some are content and curiosity fun, but all inspire connections and applicability. They are EMPOWERING. Every PD should make us feel the way that we feel when we leave one of these awesome educational opportunities. To remold adult learning in our building, we needed to capture this energy. The establishment of our “Instructional League of EdTechies” was to serve as our energy source for making this culture change possible. No, no, no, this is not your standard technology committee- it is a “secret” society, adorned with code names, agent cards, badges, and most definitely some capes! What support can we offer to teachers with integrating/infusing technology purposefully? How are we supporting CCSS, etc. with devices? Notice that our driving questions are not just about technology, but are about it being purposefully done to support practice. The driving questions touch on the idea of being connected learners as well. There’s a reason that I even put the word “Instructional” into The League’s name, although it may seem repetitive to those familiar with educational technology. I wanted to clearly define the purpose and place emphasis on practice. We spent the early months establishing ourselves and building the culture of our group- we needed to let go of worries or feelings of inadequacy in tech skills, each member needed to see their “super powers” because everyone has them! Plus, if this was truly going to be the catalyst for change in adult learning, I had to make that very clear from the start. That’s why every member received an agent identification card at the first meeting (pictured on the left). With our identification cards in hand, we were all now a part of The League and had taken on an identity, were charged with a mission, and were aware of each other’s experiences and strengths. To further connections and to create conversation about educational technology, we have some “Teacher Swag” (pictured below) that we pass around the building to affirm meaningful technology integration and to create an awareness. 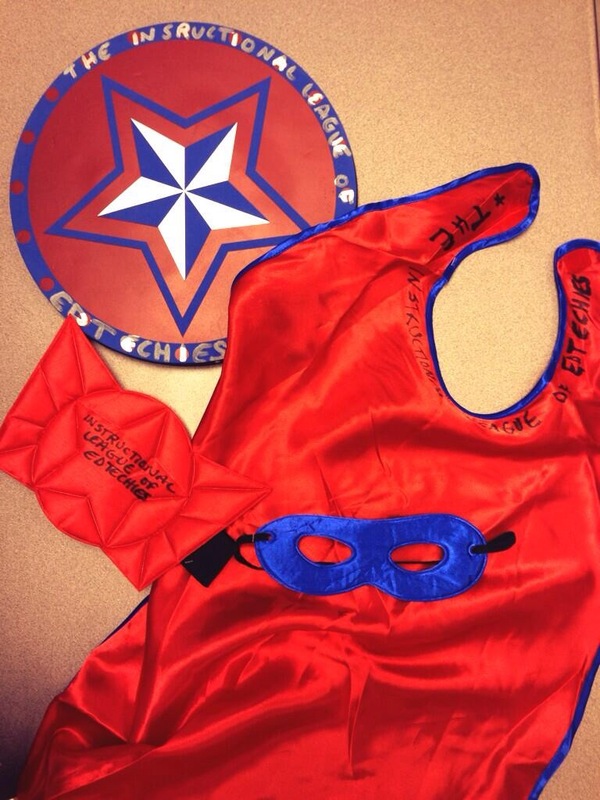 This super hero paraphernalia is passed to all teachers and is from all teachers, not just from The League members. When you receive it, you can hang it in your room, wear it, have students wear it when teaching about a technology, and the list goes on. When you are ready to hand it off, you write the name of the next recipient on the object itself and the reason for which they are being awarded this “token”. The capes, shield, etc. were a reminder to connect with those around you and once our teachers became more connected, they noticed a lot more meaningful integration taking place so we actually had to purchase more capes as the year progressed. With 75 teachers on staff, we started the year with about 10 members in The League and grew to 22 members by March! One of the most exciting things about The League is that we have members from every grade level and subject area (from Special Education, to Algebra, to Spanish) and we range in our comfort with technology. Within the hour that we spend together once per month, we start our meetings with a chosen “Slam”. From our favorite Common Core resources, to Mac user tips & tricks, to Web 2.0 tools, we start our meetings by creating energy. We then move on to exchange ideas, tools, and brainstorm ways to meet the needs of our students (and sometimes our own needs!). It’s about more than technology, it’s about collaboration and creativity. The League is now taking ownership over the content and sharing their curiosities by determining what we’ll explore at our next meeting. For example, last month a member asked if we could devote a meeting to productivity and executive functioning, so we did! Now that we’ve grown in our comfort with trying new technologies, we don’t go over the actual technical steps of the tools we discuss because we have now set the tone for clicking and playing. Keep in mind that this growth is just from September to April of one school year so far. We have a lot of fun playing and exploring together, but each member of The League is also being provided with the opportunity of leadership and they are taking that responsibility seriously. The questions that their teammates are now bringing me are much less about technical items and are more grounded in ideas surrounding instruction. They are either utilizing The League members to answer their technical questions or the exploration is catching on and they are becoming more confident in doing a little research and playing to figure things out. In February, we were provided an opportunity to lead an after school PD that lasted an hour and a half during one of our staff meetings. There were no goals specifically defined by our administration, other than helping our colleagues prepare for the full transition to 1:1 next year. This was our opportunity to bring play and exploration to a larger group of adult learners, in a more formal setting. 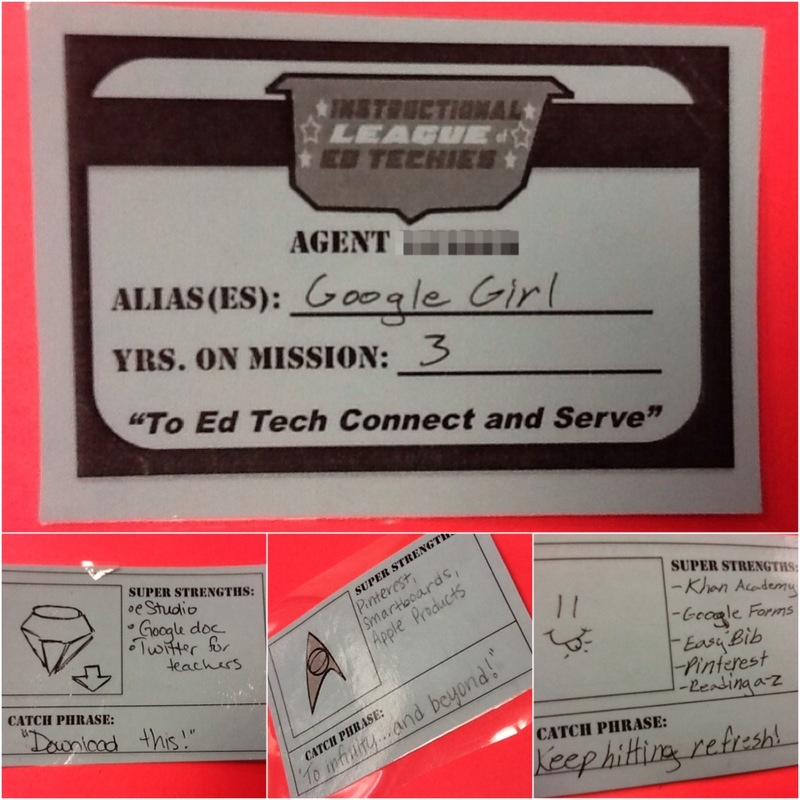 Each member of The League received a badge before this event to help and identify them publicly as an educational technology leader in our building. The badge, which a majority of them wear daily, is just a small representation of the exceptional resource these educators are for one another! This is only the beginning of our journey, as we continue to join forces and take our classrooms and learning community to new levels. In fact, now that I’ve cleared mental space with this post, I owe you a post about the fun we had leading our February PD! Promoting a Culture of Play & Exploration in Adult Learning by Candace Marcotte is licensed under a Creative Commons Attribution-NonCommercial-ShareAlike 4.0 International License. Categories: PD | Tags: Adult Learning, Connected Learning, Culture, Exploration, League of EdTechies, Play, Staff Development | Permalink.